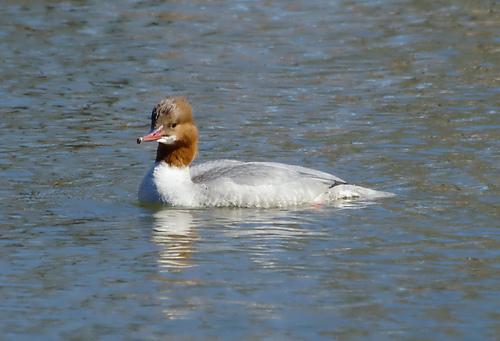 The Common Merganser (also called the Goosander) is a graceful bird, lying pretty deep in the water. It is an excellent fish-hunter and an agile under-water swimmer. In western Europe, you will mostly see it in winter. The Common Merganser breeds in northern Scandinavia and Russia. 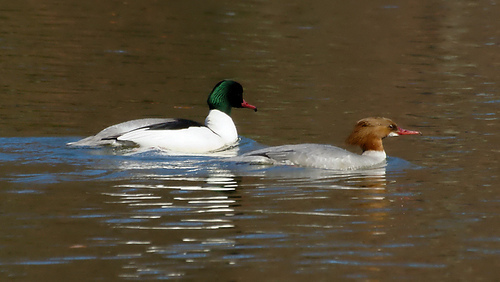 The female Common Merganser has a sharp division between brown and white on the neck. The Red-breasted Merganser has a vague division on the neck. The female Red-breasted Merganser has a characteristic thin beak, a Smew has a duckbill. The head and neck of the Merganser are completely brown.